It's not just for people with celiac disease. But is it for you? In the world of trendy diets, the latest catchphrase is gluten-free. This eating style is absolutely essential to people with celiac disease, who can't tolerate even small amounts of the protein gluten, which is found in grains such as wheat, rye, and barley. As many as two million Americans may have celiac disease, yet only 300,000 have been diagnosed with it. Many people who have not been diagnosed with celiac disease are following a gluten-free diet. "Yes, it's a popular diet of the moment, but it really does seem to provide some improvement in gastrointestinal problems for a segment of the population," says Dr. Daniel Leffler, an international authority on celiac disease and an assistant professor of medicine at Harvard Medical School. and problems related to malnutrition. 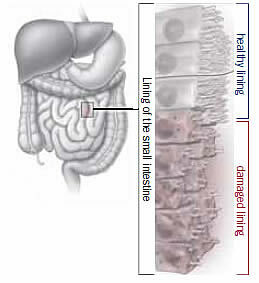 Celiac disease is a condition that causes the immune system to attack the lining of the small intestine. A biopsy revealing this damage (along with certain blood tests) is how celiac disease is diagnosed. It's triggered by gluten, and the damage that results causes not only gas, bloating, diarrhea, constipation, headache, trouble concentrating, and fatigue, but also weight loss and malnutrition (due to an inability to absorb vitamins and minerals). Until very recently, it was believed that celiac disease was the only condition triggered by gluten. However, there is now good evidence for a condition called nonceliac gluten sensitivity. "It causes similar symptoms," says Dr. Leffler, "but there's no intestinal damage. We don't know why this happens, but we do know gluten and related proteins in grains can draw water out of the intestines and feed bacteria in the intestines, causing gas, bloating, and indigestion." If you suspect you might be reacting poorly to gluten products, the first step is to determine if you have celiac disease. A blood test looks for the presence of antibodies that attack the small intestine. To make sure the result is accurate, it's important to take the test before beginning any type of gluten-free diet. If the result is positive, you'll need to undergo a biopsy procedure to determine if there's any damage to the lining of the small intestine. If the test is negative, but you still have recurring symptoms after consuming gluten, you may have gluten sensitivity. How will you know? There's no official test. Your doctor can make the determination based on your particular health conditions and symptoms, says Dr. Leffler, or you can attempt a gluten-free diet for a brief time on your own to see if you feel better. People who have celiac disease are so sensitive to gluten that even a crumb of food containing the protein can trigger severe indigestion and diarrhea so sudden and severe that it can cause life-threatening dehydration. The only fix for the condition is a lifelong avoidance of gluten, which allows the lining of the small intestine to heal and makes symptoms go away. Cutting out gluten is more than just a matter of buying gluten-free products in the grocery store and avoiding obvious foods with rye, barley, or wheat—such as bread, cereal, pasta, and pizza. "It takes a long time to learn how to live gluten-free," says Dr. Leffler. You'll have to become a gluten detective, scouring food labels and looking for hidden gluten. "It's everywhere," says Dr. Leffler, "in everything from frozen vegetables to soy sauces to medications. For example, a lot of ingredients that say 'natural flavorings' have barley as a base." The gluten-free diet also comes with malnutrition risks, since cutting out these products may mean you're reducing your fiber intake from whole grains, or missing out on vitamins that you'd normally get from fortified foods. If you have celiac disease, you may already be malnourished, so Dr. Leffler recommends that you meet with a registered dietitian before beginning a gluten-free eating plan. If you believe you have nonceliac gluten sensitivity, Dr. Leffler says you can try the gluten-free diet just long enough to see if it makes you feel better, but you should then meet with a dietitian to work out a plan that ensures you'll get enough fiber and vitamins for the long term. He also recommends that you turn to support groups for help, either at your local hospital or on the Internet (through sites such as www.celiacnow.org). "They'll have done a lot of the work already. They'll know which restaurants are safe and which supermarkets have a lot of gluten-free products," he says. For people who do have nonceliac gluten sensitivity, it may be effective to eat a reduced-gluten diet. He says the majority of his nonceliac patients who follow the diet are not strict, and they don't worry about hidden gluten. But he points out that gluten sensitivity levels vary, so it will be a matter of trial and error before you get it right. "Most of all, remember to be patient. It takes time to adjust," says Dr. Leffler.